Have you ever wondered WHY so many attorneys run for office? Have you ever wondered HOW the attorneys run for office? Oh, I know that you really never gave it much thought. You may not have a clue whether your representative, senator, or councilman is a member of the Texas State Bar Association. You will see below that The State Bar of Texas is an administrative agency of the state�s judicial branch of government. This information should make you believe that any member of this Texas State Bar is more than likely an attorney and an officer under the judicial branch of the government of the State of Texas. Which brings me to the problem at hand. Can someone that is an officer of one branch of government (Judicial), be appointed or elected to one of the other two branches of government (Legislative or Executive)? If this is determined to be legal, lawful, ethical, moral and constitutional, the next question is: Does the constitution allow a member of the Legislature to vote on a bill whereby that member would benefit from the passing of such bill, because of the career of such member? �The State Bar of Texas is an administrative agency of the state's judicial branch, and is charged with providing educational programs for the legal profession and the public, administering the mandatory continuing education program for attorneys and managing the grievance procedure. The Bar is a unified state bar composed of 62,500 members with total budgeted revenues of more than $26 million dollars per year. The State Bar of Texas had its beginnings in 1882 with unification coming in 1927. The State Bar Act was adopted by the Legislature in 1939 and mandated that all attorneys licensed to practice law in Texas belong to the State Bar. � Section 22. A member who has a personal or private interest in any measure or bill, proposed, or pending before the Legislature, shall disclose the fact to the House, of which he is a member, and shall not vote thereon. 73 out of 150 Texas House of Representatives were part of the Judicial branch with some law students and some not stating their previous or current occupation. 27 out of 31 Texas Senators were part of the Judicial branch as their previous or current occupation. 1. How could� 73 Attorneys or Lawyers in the Texas Legislature of the House of Representatives vote for The State Bar Act in 1939 when it was enacted? 2. How could 27 Attorneys in the Texas Legislature of the Senate vote for The State Bar Act in 1939 when it was enacted? � Section 1.� The powers of the Government of the State of Texas shall be divided into three distinct departments, each of which shall be confided to a separate body of magistracy, to wit: Those which are Legislative to one; those which are Executive to another, and those which are Judicial to another; and no person, or collection of persons, being of one of these departments, shall exercise any power properly attached to either of the others, except in the instances herein expressly permitted. 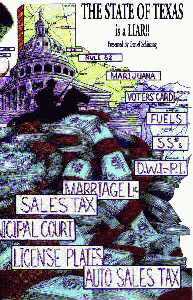 After soaking in the above information; is there a slight possibility that every Law, Act, Treaty, Resolution, Regulation, Statute, Code, Ordinance, Rule, Policy, Custom, Tax or whatever, was voted thereon by a Texas State Bar member, that was elected in the Texas Legislature, be unconstitutional, when the vote created revenue for other attorneys? Is there a slight possibility that attorneys can NOT run for election for the Legislative or Executive branch of government? Does the above information show WHY there are more laws passed in the United States than all other countries combined? Does the above information show WHY the United States have more people incarcerated than all other counties combined? Find out if the guy or gal running for office is an attorney or would you like more of the same? Many people associated with the San Jacinto Constitutional Study Group are credited with discovering the information that is found here. It is up to you to stop the unconstitutional acts that have occurred in the past and� will occur in the future. VOTE the attorneys OUT of the Legislative and Executive branch of government and get the common man or woman to change Texas back the way it is suppose to be. Judges held accountable for their unconstitutional decisions. Attorneys held accountable for bring charges against people for victimless crimes. Police held accountable for jailing people for an offense that has no jail time. Juries that can judge the law as well as the facts of the case. People held accountable for their actions without plea bargaining. Have a government to protect and defend instead of a government to take and spend. Thanks to RealityExpander.com for allowing us to spread the truth. All information found in this article will not be considered as legal advice. All Information should be verified by the reader. Permission to copy is granted. The truth should always spread.